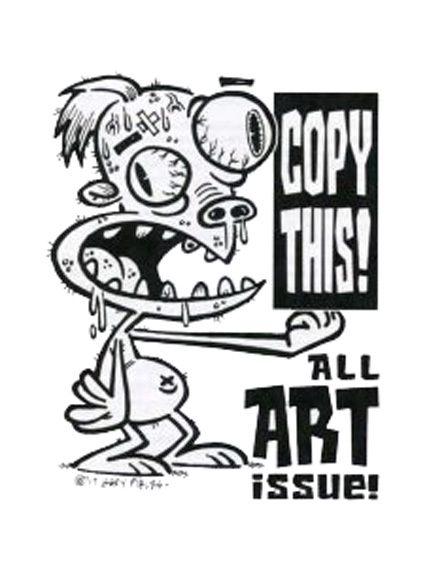 I have a story in the new issue of Copy This! - #47. Carl Alessi, Verl Holt Bond, Tom Brinkmann, Charles Brubaker, Brian Buniak, Buzz Buzzizyk, Bruce Chrislip, Kel Crum, Gary Fields, Brad W. Foster, R.C. Harvey, R. Hendricks, Doug Holverson, Mike Kraiger, Brian Leonard, Dale Martin, Nate McDonough, Bill McKay, David Miller, Tom Motley, Marc Myers, Andy Nukes, Aaron Poliwoda, Artie Romero, Jim Siergey, Larry Tisch, Bob Vojtko, Bob-X, and Adam Yeater. The cover above is by Gary Fields. Copy This! is available from D.Blake Werts for $3. Contact him at bwerts@vnet.net for details.